Lightening Fingers...................not! : More finished and a fun little thing! More finished and a fun little thing! color and will post that tomorrow. It calls for both Anchor and DMC and when I received the Anchor threads I had to order I had a quick intake of breath as they are so beautiful. I seem to be having a "mom" thing going on at the moment as the Iris was one of her favorite flowers and I've been looking for just the right pattern for a long time. Will show you tomorrow. series and saw that #3 is out so will have to do it! 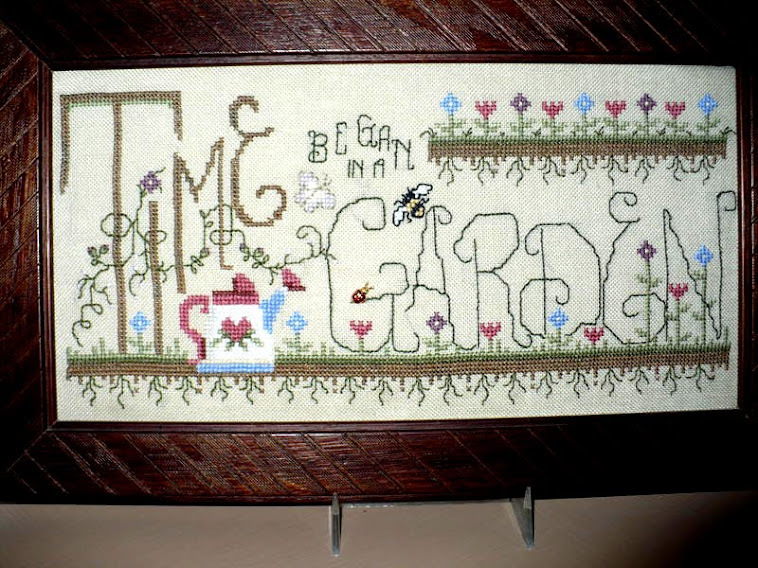 several points in the border to replace the cross stitch. a bit. Am really liking these. with scissors, had been wanted to change it and this seemed fun. Hope is really pretty! Your peacock "scissor" frog is fantastic! How fun! Oh! That little bird is fun! Congrats on finishing hope! Thanks ladies. I don't know about you, but I go through these periods thinking I'm going to give up stitching, but then get caught by so many that "I just have to do" that the love affair continues! Congrats on your adorable finish. Love the scissor frog, too! Love your finish! And darling scissor frog!